Botany Bay Pre-school opened in June 2008. We are driven by our passion in providing a very high standard of care and learning. Over the years we have been part of building many friendships and have a strong reputation within our community. 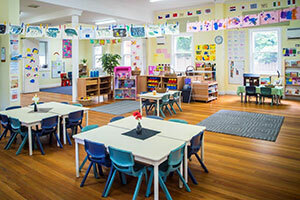 Botany Bay Pre-School is a privately owned and run care and education Centre, operating out of a restored heritage building. We are located on the corner of Ivy and Bay Street Botany, a quiet residential area. Botany Bay Pre-school is licensed for 38 children per day aged between 2-5 years. For most part of the day, children are separated where specific experiences are planned for groups of focus children or individual children, as they explore particular interests and develop certain skills. Botany Bay Pre-School is open from 8.00am- 5.30pm Monday- Friday. We are open for 49 weeks of the year, closing for 3 weeks over Christmas and on Public Holidays. This forms part of our accreditation allowing parents to claim Child Care Benefits and Rebates. Our team of early childhood educators are very well educated, dedicated, motivated and enthusiastic in providing a care and education service of the highest standard. We work with above required staff/child ratios. This allows for shared and collaborative learning between children and educators. This in itself has significant benefits on the children’s interest and overall learning and social interactions. Our educators are all permanent staff ensuring that children and parents enjoy stability and confidence in our staff. We ensure our learning space is welcoming and inclusive to all children and families who attend. We also endeavor to provide a learning space that intrigues the children and encourages exploration, learning, fun and a sense of belonging in the environment. As early childhood educators we recognise that we are always learning and thus take part in regular professional development. This ensures that our knowledge and pedagogy is parallel to current educational research and best practice. We have been awarded an “Exceeding National Quality Standard” rating in the Assessment and Rating process by the Australian Children’s Education and Care Quality Authority (ACECQA). This is a great result for our team and service. This rating also reinforces the quality of care and education environment that we provide to our local community.